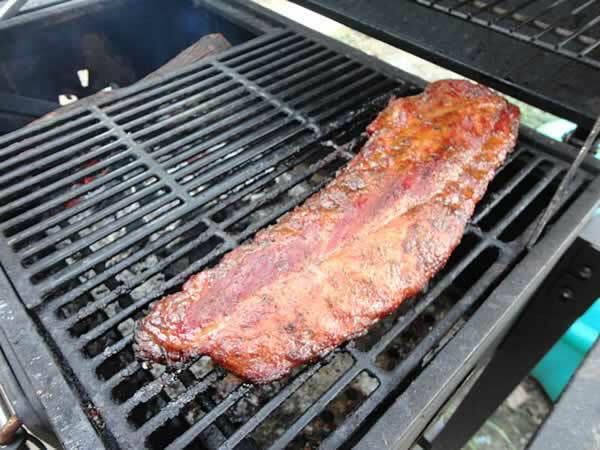 How to correctly cook ribs using a home grill.. Cooking ribs good enough for a BBQ competition on your home grill might sound like an impossible task, but it can be done with a little practice. BBQ Competition ribs have more layers of flavor than ribs you would typically cook on the smoker at home because more steps are involved during the cooking process. I typically add more layers of flavor and seasonings than I normally do when I throw a rack of ribs on the BBQ pit. Using a better quality meat such as Berkshire or Yorkshire is also advised. The ribs available at your local supermarket are usually not the same quality as some of the better choices available, but they are less expensive. 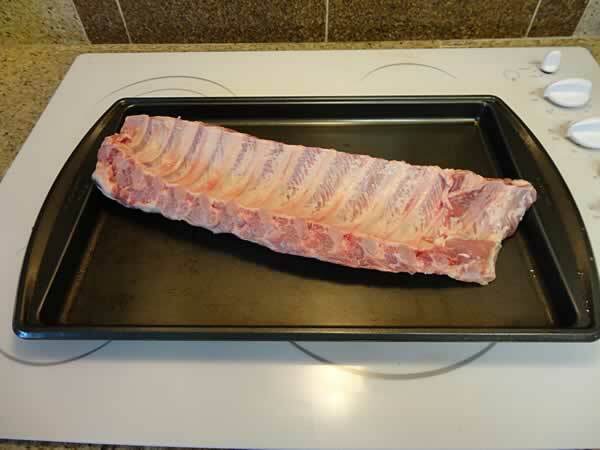 I have outlined the process of preparing ribs to cook on the home grill below. Prepare to trim the membrane off of the ribs. Insert the tip of a knife under the membrane and seperate it from the rib bone. Use a paper towel to grab the membrane, and it will be much easier to pull off. Apply your favorite rub and a little brown sugar, or a lot! If you set up an indirect, or two-zone system in your grill, it will work just like a smoker. Build the fire to one side and make a small fire. Wrap ribs in foil to finish cooking. Ribs are done and ready to slice. This step is a must. If you leave the membrane on the ribs, they will most certainly be tough. The membrane is located on the back of the ribs and is easily removed by taking a sharp knife and cutting one end loose from the ribs. I typically start on the narrow end. You can then grab the membrane and peel it off. A great trick is to grab the membrane using a paper towel to increase your grip and make it easier to pull off. Completely remove all traces of membrane. Next, trim all loose pieces of fat and extra meat off of the ribs. The side of the ribs that the membrane is on will have an extra layer of meat that looks too thick. You want the ribs to look uniform and clean. Turn the ribs over so the bone side is down. There is usually extra fat located at the narrow end of the ribs. Trim this but do not remove all of the fat. Leaving some fat on the ribs is okay and the fat will render during the cooking process, aiding in keeping the ribs moist. Once the ribs are trimmed, it is time to season them. Apply a thin lay of yellow mustard or cooking oil to the ribs. This will give the rub something to stick to. Use your favorite rib rub and add a nice layer of seasoning to both sides of the ribs. You want a nice, uniform layer of seasoning on the ribs so use some type of shaker of seasoning container to apply the rub. 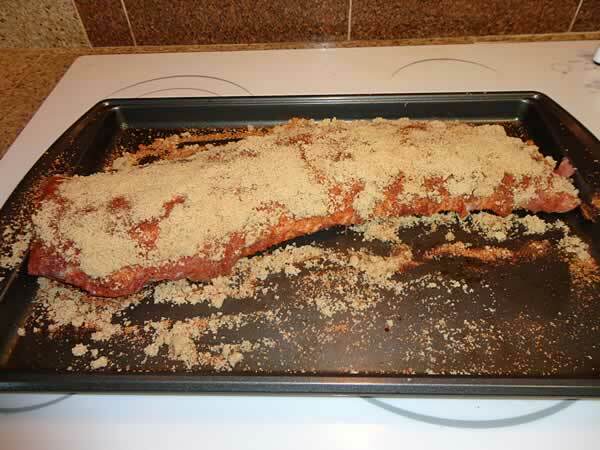 Next, sprinkle an even layer of brown sugar on the ribs. As the ribs sit, the brown sugar actually melts and almost looks like a liquid. 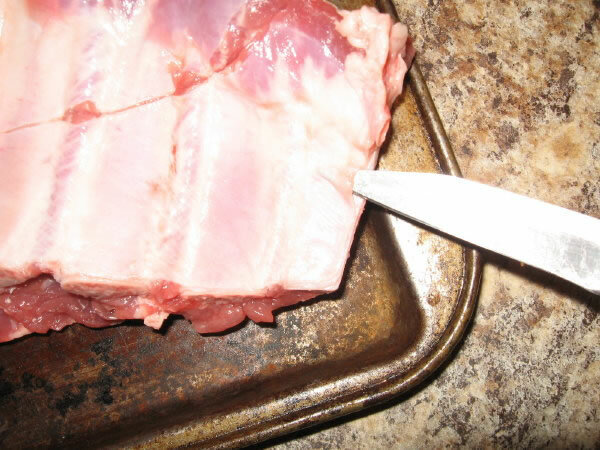 You can wrap the ribs for later use and to let the seasoning soak in a little, or put them on the pit. Smoking ribs is a low and slow process. I try to smoke the ribs at 225-230 degrees F for five hours. Once the smoker is at the temperature you want put the ribs on. Spray the ribs every 30 minutes with a mixture of 3/4 apple cider and 1/4 cooking oil. This mixture can be placed in a spray bottle for easy application. Once you reach 4 hours, lay piece of heavy foil down large enough to wrap one rack of ribs, and move one rack of ribs to the foil. Apply Parkay Squeeze butter to the top of the ribs by making a zigzag pattern. Pour some hot apple cider into the foil so that it covers the ribs 1/4 to 1/2 way, and tightly seal the foil. Place the ribs back on the smoker for 45 minutes to 1 hour. Make sure there is fluid in the foil at all times, or the ribs can burn at this point. The ribs are done and ready to slice. I use a very sharp knife and slice the ribs bone side up. Placing them bone side up helps you to see where to cut. I actually smoked these indirectly on my BBQ grill. After doing it a few times, I can control the heat exactly as I do in my smoker by knowing how much wood to add and where to set the vents. 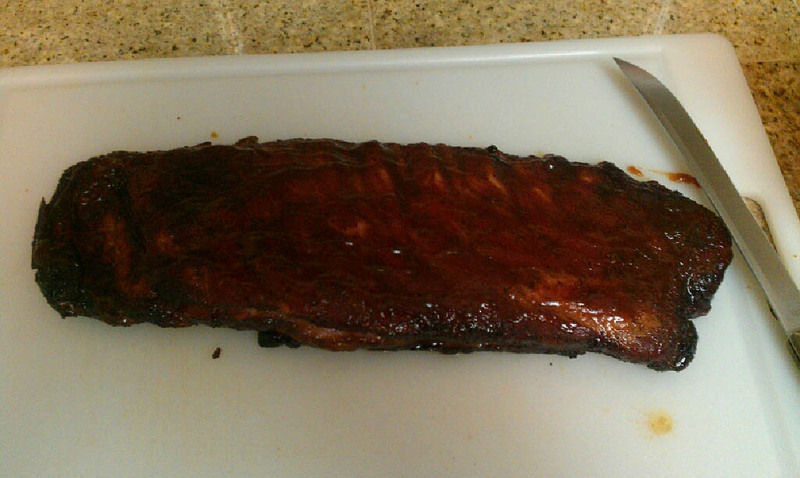 Tip: Once you have prepared that beautiful rack of ribs, it would be a shame to ruin it with a dull knife. I always use a Victorinox 12-Inch Granton Edge Slicing Knife with Fibrox Handle to make sure my slices are precise, especially during BBQ competitions.